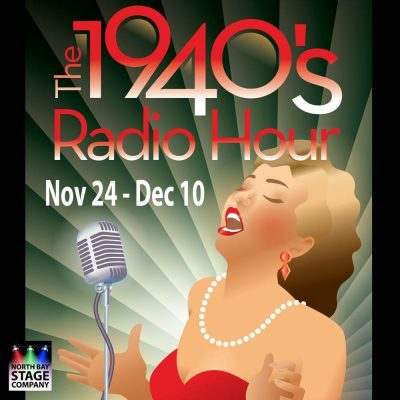 Welcome to the North Bay Stage Company’s production of the 1940’s Radio Hour! Virtual Auditions: accepted any time up to Sept 24th submission deadline. It was a time before TV’s and most definitely before the technology we live with in today’s society. Let us take you back to a time where the world had only radio broadcasts to link them to “live” news and entertainment. Picture a family around their radio after dinner. Mama’s knitting, Daddy’s reading the news paper and the kids lay on the living room floor playing checkers listening to a broadcast of the “Mutual Manhattan Variety Cavalcade”. The country was united together in fighting the War. WWII that is…when it is believed that WWII was the last war that the government did not hide anything from the American people, especially when it came to war. USO shows abounded in order to keep troop morale lifted. Everyone did his or her part in keeping the country going …and, the Cavalcade was no exception. They brought joy into every home tuned into each broadcast. 1940s Radio Hour is a comedic yet poignant show getting ready to record a broadcast for the troops overseas. Note: Take a look at broadcasts from “Prairie Home Companion”, a still-running radio broadcast http://prairiehome.publicradio.org/ and learn about their history at http://en.wikipedia.org/wiki/A_Prairie_Home_Companion and you will have the feel we want for our production. Special thanks to Samuel French and Farmington Players for compiling some of this information. Broin. Produced by: North Bay Stage Company.